Holiday Wreath Decorating - Inspired by the Movie "White Christmas"
Who knows if we'll be having a White Christmas this year, but I thought this is just what Major General Waverly might have put on the front door to the lodge in Vermont. Apple, poinsettia, plaid, and, of course, a butterfly (my signature decoration). 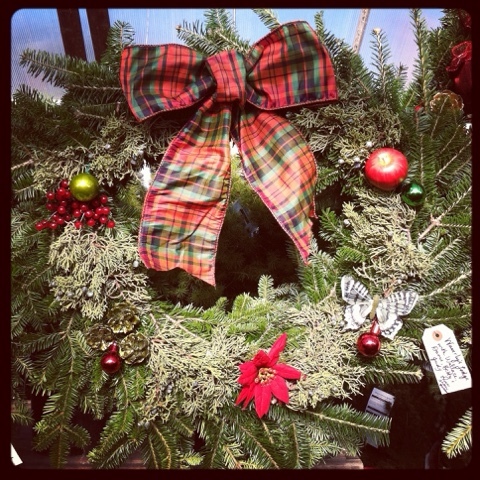 Another way to spruce up (pun) your wreath is to add elements from other evergreens. I've added sprigs of juniper. I stayed with classic Christmas colors, and lots of outdoorsy notes, just as you'd expect from a lodge in the woods of Vermont. All the songs in this Christmas movie are great. And so catchy. Try not to sing "Snowww, snowww, snowww, snowww..." now that you've read this. Or "Sistersss, there were never such devoted sistersss..." and, of course, the timeles classic title song. So pretty.